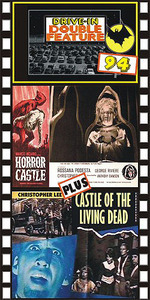 HORROR CASTLE (1963) Christopher Lee, George Riviere, Rossana Podesta. There’s a monster afoot! A beautiful lady finds herself completely terrified inside a crumbling castle. The ghost of a medieval maniac, “The Punisher,” is on the loose and killing off people in a variety of grisly ways. The rat-eating-the-girl’s-face scene is unbelievable! Turn your head when the Punisher is unmasked; this is one very scary face. Lee is great as the scar-faced curator. Nice color, from 16mm. Plus: CASTLE OF THE LIVING DEAD (1964) Christopher Lee, Gaia Germani, Donald Sutherland. A troupe of entertainers finds themselves in peril as guests in Lee's mysterious old castle. Lots of great atmospheric scenes in this fine Euro horror thriller. One of the better films Lee made while in Europe during the ‘60s. This was Sutherland's first film. From 16mm.